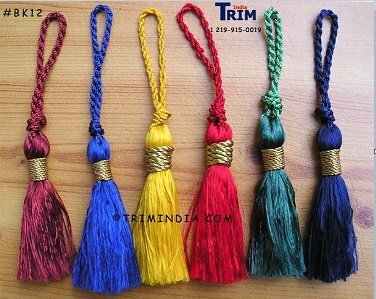 TrimIndia is the largest manufacturer and exporter of Tassels & Trimmings. TrimIndia was founded in 2001.The range of our product line, good quality and competitive price have made us one of the fastest growing company. Since then we have expanded our market year by year. We works with importers and chain stores in the US, EUR0PE and other Countries. In addition to the products manufactured by our factories we assist our customers in all aspects of importing from India. 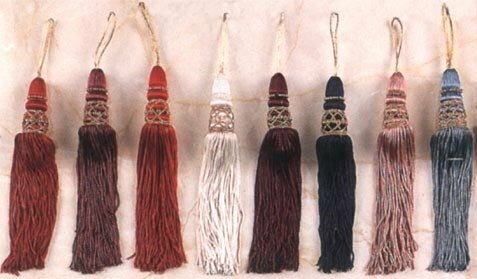 We manufacture trimmings to offer you complete collections of tassels, tiebacks, trimmings, at prices you will not believe. Our selection and quality can not be matched. In addition to our wide product range, we are constantly endeavoring to create according to the specific needs of the customer. Discount Pricing is available to all genuine importers, chain stores, & wholesalers for orders above $2000 Give us an idea of what sort of QUANTITIES you are looking to import per item and your TARGET PRICE. We just need a general idea, and we will send you our Wholesale F.O.B prices. We will match your price. All our Products are made in-house and can be custom made as per your specifications. To keep our overheads low & pass on the cost benefit resulting from this saving to our customers, we follow following sample policy. We send all samples of regular products which does not involve development on FREE OF COST basis. We request new buyer to bear cost of courier charges. Once wholesale business starts, we send samples with all cost including courier expenses to us. 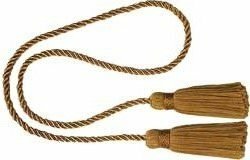 In case of inquiries coming from internet, we always ask buyer to bear courier cost. 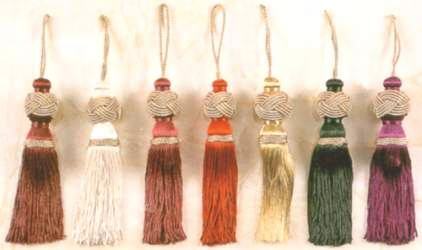 We have a LARGE selection of styles and customized colors of Key Tassels, Drapery Tassels, and Drapery Trims to choose from..... Key Tassels, Drapery Tassels, and Trims are EXCELLENT for adding extra color and style to furniture, curtains, drapes, and home decor. 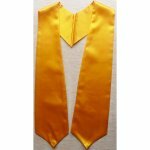 We have a large selection of drapery tie-backs and tassels at lowest prices You can find over 1000 Key Tassels, Tie-Backs, Chair-Ties, Drapery Embellishments, and Drapery Trimmings over here.